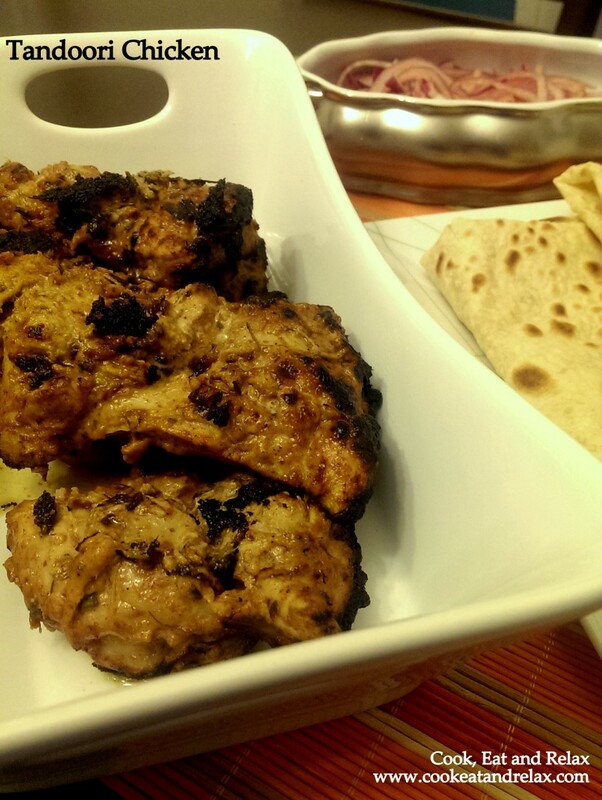 At last a Chicken Tandoori recipe I love! I have tried my hand at making the perfect tandoori chicken innumerable times. It was just never quite right. So last night when I decided to try my hand at tandoori chicken once again, I did not have high hopes. But I wasn’t gonna give up after all… That’s just not me. So I researched a few recipes online and decided to try my hand at my version of tandoori chicken one more time. And it was awesome even though I say so myself! So here’s the recipe for my version of tandoori chicken, and I think the reason I loved it this time was because, I used a mortar and pestle and dry roasted and ground the spices myself. And the amount of yogurt and the quality of yogurt made a big difference as well. No low fat or non fat yogurt just whole milk yogurt and we need to use just 4 tbsp anyways. Dry roast the first five ingredients (star anise, mustard seeds, cloves, dried red chili and fenugreek leaves) one at a time and transfer to a mortar. Make sure that you do not burn any of the ingredients, transfer it to the mortar as soon as you get the fragrance of the spice. Coarsely grind the spices using the mortar and pestle. Then add the ginger and garlic and crush it along with the dry spices to a paste. Next transfer the ginger, garlic and spice mixture to a separate bowl and mix the rest of the ingredients excluding the chicken to a smooth paste. Now marinate the chicken in this marinade for about one hour (that’s how long I marinated it, or longer if you would like to). Once you are ready to roast the chicken, turn the broiler on and line a baking dish with aluminum foil. Place a roasting grill on the pan and spray it with a little oil. Now transfer the chicken pieces to the roasting grill and sprikle the butter on top of it. Transfer the chicken to the oven and turn to the other side when the chicken starts showing some black spots from the roasting on the top. You need the chicken to blacken in some spots. But make sure that you do keep a close eye on the chicken so it does not get overcooked. It takes about 10 – 15 mins for a batch to get ready. Serve with some sliced onions, marinated in some vinegar, lemon juice, salt and chili powder. I chilled the marinated sliced onions in the freezer for about 10 mins before serving. This was one of my quick and easy weekday dinners. I served it with some of the sliced onions and roomali roti (kind of thin bread). That recipe to follow once I master it. 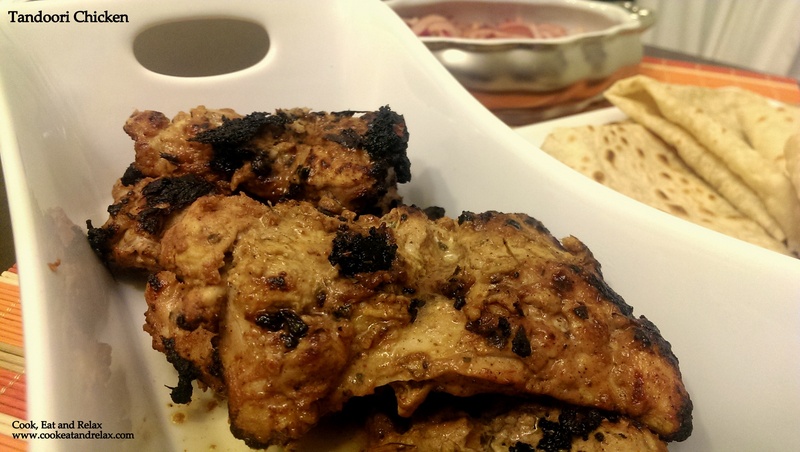 I love tandoori chicken that is made just right and I loved this recipe. I did not make it too spicy and did not add any orange coloring like they traditionally do. It looked awesome and tasted equally brilliant. Hope you do try this recipe, if you do please leave me your thoughts. Thank you for reading my blog. This entry was posted in Chicken, Main Course and tagged Chicken, tandoori. Bookmark the permalink.